Saxman: New Replacement Totems To Be Raised - The City of Saxman, Alaska will be raising two 13-foot tall bear totem poles in Totem Row Park on August 6th at 1pm. The poles are replacements for two older Bear Entrance Poles on Totem Row Park’s Frog Wall, which have reached the end of their lifecycle. New replacement poles will be hand-raised in the traditional fashion. The dedication event will also feature song, dance, oratory, and refreshments. Carver Donnie Varnell will be present, along with a range of exciting guest speakers, who will recall the history and significance of Saxman’s Totem Row Park. Totem Row Park was constructed in the 1930s through a federal Civilian Conservation Corps (CCC) project. Totem poles were collected from abandoned Tlingit communities such as Cape Fox and Tongass, then transported by boat to Saxman, where they were restored or recarved in the community's waterfront ANB hall. In addition to preserving traditional artwork, the CCC project helped facilitate the transfer of carving and restoration skills to a new generation of Saxman residents. Alaska: WOOD MACKENZIE STUDY SHOWS AN ALL-ALASKA GASLINE PROJECT COULD GENERATE UPWARDS OF $400 BILLION IN REVENUES TO THE STATE; Superior Economics of Large-Volume Pipeline from Prudhoe Bay to Valdez Proven by Analysis – The Alaska Gasline Port Authority (AGPA) released the results of the Liquefied Natural Gas (LNG) Project Comparison Study performed by global energy analysts Wood Mackenzie. The study, released Wednesday, compared the economics of the large-volume All-Alaska Gasline/LNG project to Valdez - which runs parallel to TAPS, with a spur line to Southcentral Alaska—with nine other LNG projects being advanced or under construction in Australia, Western Canada, and the Lower 48. The report concluded that due to Alaska’s competitive advantage and strong price forecasts for the Asian energy markets, the All-Alaska Gasline could generate State revenues of $3 billion the first year, increasing annually to $5 billion in Year 5 and up to $24 billion in Year 30. Wood Mackenzie estimates the project could generate between $75 to $419 billion in total State revenues over a 30-year life. Currently, the State of Alaska receives approximately $5 billion annually from oil revenues. Southeast Alaska: Celebration of Prince of Wales Watershed Restoration Planned – The U.S. Forest Service, The Nature Conservancy, and partners are gearing up to celebrate the completion of a critical watershed restoration project on Prince of Wales Island. The project, known as the Harris River Restoration Project, is an important large-scale effort by a broad-based partnership of local organizations and stakeholders, state and federal agencies, and conservation groups. The seven-plus-year project includes more than 11 miles of stream restoration; eight miles of road work to improve fish passage and reduce erosion; over 400 acres of tree thinning for habitat improvement; and extensive trail and recreation enhancements. Southeast Alaska: SEARHC, Hoonah mourn death of Chuck Luck and his wife – The recent crash of a Cessna 182 near Eaglecrest Ski area was closely followed by SEARHC believing that the pilot was their Hoonah Health Center employee, Charles W. “Chuck” Luck. Mr. Luck and his wife, Liping Tang-Luck, were on board the plane when it crashed. 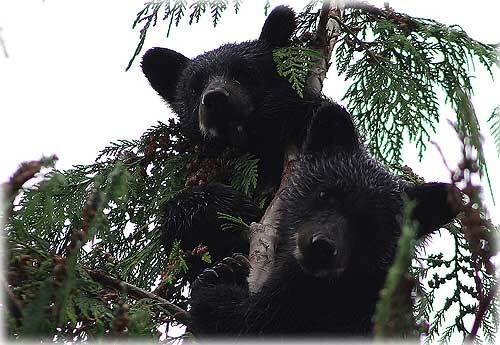 Both were on their way from Hoonah to Juneau and were not heard from after they checked in with the Juneau tower. Chuck started working for SEARHC in Hoonah in June of this year. He was 77 years old and had 11 years experience as a physician assistant in Alaska. Alaska Science: Sea ice study goes beyond the numbers By NED ROZELL - In places where the air gets cold enough to freeze seawater, sea ice creates a world known by few people - a shifting, ephemeral, both jagged and smooth platform of white that clings to the shore for much of the year. In Barrow, people who hunt whales start packing down snowmachine trails over this blue-white dreamscape in March. The trails allow a few dozen crews to pursue and hopefully winch home a few bowhead whales in April and May. 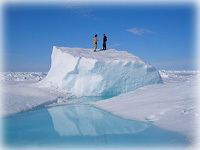 Matt Druckenmiller, right, and his research advisor Hajo Eicken, a professor of Geophysics, on an ice floe near Barrow. DAVE KIFFER: Cats 2, Bathroom Doors 0 - The score is now Clever Kittens 2, Kiffer/Glover family 0. You would think we would have learned our lesson seven years ago when our brand new tiny male kitten locked himself in the bathroom. You see we have this problem with one of our downstairs bathrooms. The door opens inward and right next to the door are the drawers for the bathroom vanity. If the one of the drawers is left open the door can’t swing open. I know what you are thinking, but the yes the hardware is also on the inside of the door, so you can’t just de-hinge the danged thing to get in, either. Someone must have really treasured their privacy when they built that one. Even if you remove the door knob you still can’t get in. Anyway, it’s not usually a problem. If you are inside the bathroom and you open the drawers you can obviously close them again when you want to get out. Even I can eventually figure that one out. If you are outside the door – well then you can’t open the drawers so there is no problem, right?